When setting up a workstation to tattoo, your key focus is creating an aseptic area. You want to limit the possibility that anything you do or touch will lead to the contamination of your tools (beyond the tattoo), yourself, and your client. 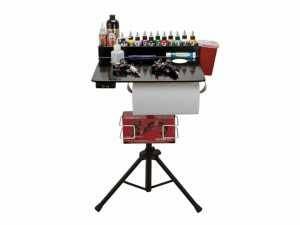 Because of this most pressing need, a proper workstation is only possible in a licensed tattoo studio. Even when extraordinary measures are taken to set up a station elsewhere, the risk remains greater than with a studio where strict guidelines are in force. 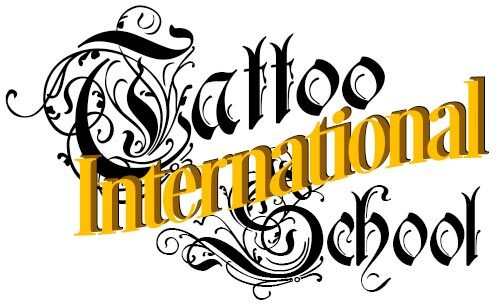 A space dedicated to tattooing where procedures are regularly followed to avoid cross-contamination is ideal. Even in a studio, the space used to tattoo should not be used for any other purpose. A tattoo workstation should be a clean area. It is not an office, not a drawing room, and most definitely not a cafeteria. Drawing, paperwork, discussions with clients before and after the tattoo, Internet research, and other business functions of the studio should be performed outside the station as much as possible. While this may not always be practical, it is the best possible practice. The minimal required items for the tattoo process should be kept in the station. Everything else should be stored elsewhere. Eating and drinking should never occur in a station. A workstation begins with a clean, non-porous work-surface. All furnishings within a station should be non-porous; metal, glass, plastic, vinyl, etc. Furnishings should be clean and well-maintained. Torn vinyl, for example, should be repaired or the item replaced. The regular maintenance of furnishings also prevents issues arising with those furnishings which might delay the tattoo application or cause the tattooist to touch things during the tattoo he or she might not have touched. Keeping the furnishings and area clean, disinfected, and dust-free will protect yourself and your client. Knowing what, and when, to touch items reduces the likelihood of cross-contamination. Begin by thoroughly washing your hands. Wash with anti-bacterial soap and warm water between your fingers, on the front and the back of the hands, and up to your elbows. It is a good idea to keep your fingernails trimmed. Put on a new pair of medical gloves. Many stations mount a glove box near the entrance of the station in order to facilitate the donning of gloves when entering, as well as a wastebasket near the entrance for removing gloves before leaving the station. Spray all work surfaces; tables, chairs, and trays, with MadaCide or a similar, medical-grade disinfectant. While some states require it and others do not, it is a good idea to label all bottles containing liquids in your station, if only to allow the client to ascertain what is being used. Allow the MadaCide to sit on the work surfaces for 3 minutes before wiping the surfaces with clean paper towels. All bottles and containers placed on your table should be made of non-porous materials and should also be cleaned with Madacide. Again, place only what you will need for the tattoo on the table; ink cap jars, rubber band jar, green soap bottle, other spray bottles (depending on your process), inks, ink cap tray (if you use one), paper towels, power supply, clip-cord, etc. The foot pedal will be plugged in and placed on the floor. Clean equipment and non-porous containers. All liquid containers should be full before being placed on the table, as a measure to avoid the need to refill the bottle during the tattoo. Bag or place barrier film on all surfaces that you will come into contact with while doing the tattoo; green soap bottle, other bottles, power supply, clip cord, and work lamps tend to be the most common items touched. Place a dental bib, plastic-side down, on your table or in your work-tray. In a pinch, a layer of plastic wrap topped with a layer of paper towels can also be used. The plastic protects the surface it is on, making clean-up easier, and the absorbent side helps manage the spill of fluids that will inevitably occur. Place dental bib for added protection. Ideally, ink bottles should only be touched with gloved hands, and then only with clean gloves. Only place on your work-table the bottles you will actually be using, if no other convenient options for bottle placement exist. Ink bottles should be opened and closed with a clean paper towel to absorb any excess ink that may spill out of the bottle when pouring ink. Ink bottles should be cleaned with disinfectant like all other surfaces in your work area when the tattoo is complete. If you do not have a paper towel dispenser in your station, separate a stack of paper towels from your paper towel roll. It is better to over estimate the number of paper towels needed than to under estimate. This prevents you form having to touch the roll with potentially dirty gloves during the tattoo (should you forget to remove them). If you do touch the roll with dirty gloves, assume the entire roll is contaminated and discard. Discard any excess paper towels not used during the tattoo. Tattoo machines should be kept clean and well-maintained. When not in use, they should be stored in a container. Avoid handling your machines with your bare hands as much as possible. Remove your machines needed for the tattoo from storage and test each machine to ensure function. Then place the machines on the dental bib. Lay out machine bags and rubber bands to be placed on the machines prior to starting the tattoo. Tattoo machines, bags, and rubber bands. Place needles and tubes needed for the tattoo on your dental bib in their blister packs or autoclave bags. Leave them sealed until the client is present for their tattoo, so they can be assured that they are getting a clean or new tube and new needles. Tubes and needles should remain unopened until needed. Place the ink caps required on the dental bib face down. Any ointments used during the tattoo should also be placed on the table. Place a new razor for shaving the tattoo area and a cup for distilled water (for rinsing your needle if changing colors) on the dental bib. Keep your sharps container nearby but away from the rest of the tattoo area. While the exact set-up varies from artist to artist, the above is fairly common. The focus of the process is to avoid cross-contamination. The more you can do to protect yourself and your clients, the better your business will be.